Porridge Kaytee Exact Handfeeding, designed especially for the hand-rearing of chicks, chosen as one of the best porridge on the market by many breeders and veterinarians. Suitable for most species of parrots. 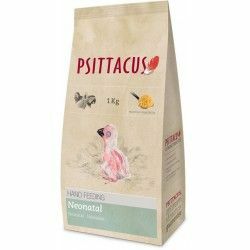 It can be used from the first day of life until the moment in which there will be the first canyons of the feather, only in the newborn stage (we recommend to use Psittacine Crop Milk Replacer in the first phase of this stage).